Blurb on the bottle: Duskrider is brewed with specialty malts for a ruby-red hue, and a hop-forward fix of tropical fruits and citrus from US Cascade, Amarillo, Citra, and Nelson Sauvin. What: It’s with a heavy heart that I note this is the very last beer in a Bach Brewing four-pack that my mate Rudy gave me for my 31st birthday. Have I saved the best for last? We’ll find out in a moment. First, let me say that I’ve yet to have a bad beer – or even an average one – from this Auckland craft brewery (they’re not paying me to say that!). So it’s fair to say that my expectations are pretty high at this point in time. So here’s hoping that Bach Brewing doesn’t finally let me down. Taste: Before the beer touches my lips, I breathe deep the fresh, tropical aroma of the Duskrider Red IPA. Oh yeah, that’s the stuff. I would wear this fragrance as a cologne if it wouldn’t make my wife immediately file for a divorce. When I finally remove my nose from my glass and actually taste the beer, I’m pleased to note the tanginess of the hops doesn’t come at the expense of everything else. In fact, I’m more than pleased; I’m bloody delighted. Far too often craft breweries stuff as many pungent hops as they possibly can into their IPAs, often at the expense of drinkability. That’s not so with the Duskrider, which is remarkably well balanced between bitter and sweet, with hints of toffee and caramel. Is it the best beer ever? 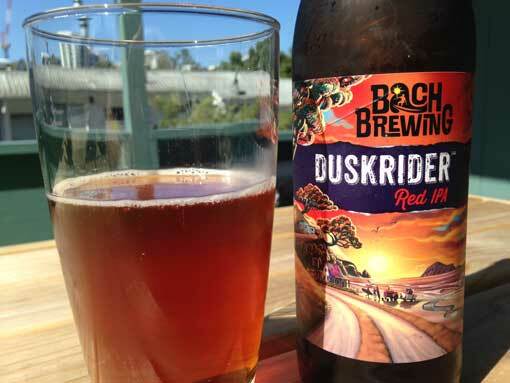 Bach Brewing’s Duskrider Red IPA is a certified award winner, having scooped the prize for best US-style ale at the Brewers Guild of New Zealand Beer Awards 2015 and been named the best specialty ale at the New World Beer & Cider Awards in 2014. I’ve sampled the Duskrider, Kingtide Pacific IPA, Cray Porter and Beachstone Pilsner and they have all been bloody good. Long live Bach Brewing!